First you will need to create a new category. You may have created a folder for the client/matter, but you can be broader or narrower with categories. For instance, if you appear in multiple courts you could create categories like “Durham County” “Chatham County” or “Orange County” and apply those categories to emails, calendared items, court personnel in your contacts, etc. Then you can search for a category to discover all items “tagged” by this category or even create a Search Folder. Categories are also useful for adding consistent keywords to Outlook items, similar to a “See Also” reference in an index. To create a new category in Mail in the Home tab in the Tags group click on “Categorize”. A drop down will appear. 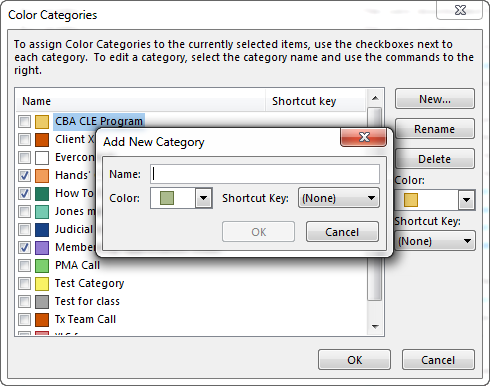 To create a new Category choose “All Categories” and in the resulting dialog box choose “New…”. 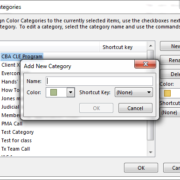 You will create a new category name and assign a color and optionally a shortcut key. You can also rename and delete categories in the “All Categories” dialog box. Once you have created categories you can assign a category (or multiple categories) to any email, calendar event, contact, or task. In email you can sort by Category by right clicking in the header row, selecting “field chooser” and clicking on “Categories”. You can search across all of Outlook (or just email, contacts, calendared items, tasks) for specific Categories or create a Search Folder for Categories. See this video for a demonstration of using Categories in MS Outlook.